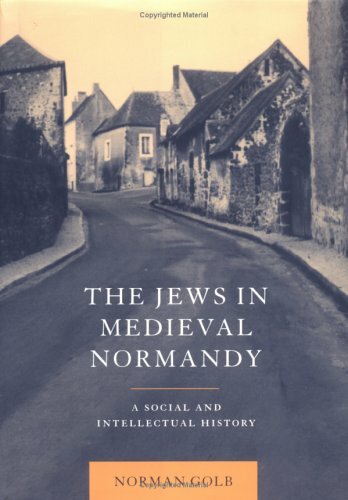 Synopsis: This 1998 book is a comprehensive account of the high Hebraic culture developed by the Jews in Normandy during the Middle Ages, and in particular during the Anglo-Norman period. This culture has remained virtually unknown to the public and to the scholarly world throughout modern times, until a combination of recent manuscript discoveries and archaeological findings delineated this phenomenon for the first time. The book explores the origins of this remarkable community, beginning with topographical evidence pointing to the arrival of the Jews in Normandy as early as Roman and Gallo-Roman times, through autograph documentary testimony available in the Cairo Genizah manuscripts and early medieval Latin sources, finally using the rich manuscript evidence of twelfth- and early thirteenth-century writers which attest to the high cultural level attained by this community and to its social and political interaction with the Christian world of Anglo-Norman times and their aftermath.